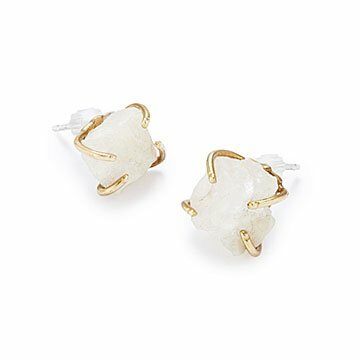 In their simple, timeless setting, Emile Shapiro's raw moonstone earrings emanate ancient powers. Known as the Traveler's Stone, moonstone is considered a protective talisman for both outward and inward journeys. Linked to lunar magic for milennia, moonstone reveals its wisdom at night—especially when lovers meet. By giving the raw stones a timeless setting of delicate, simple, brass prongs, Emile Shapiro lets the stone's story take center stage. Those born in June can claim it as their birthstone, but with a meaning so universal, its special powers aren't limited only to them. Each piece will vary slightly due to the uniqueness of the stones. Handmade in New York.